A hard wood and good quality fingerboards, violin fingerboard is providing by us. Our organization has years of experience and the required expertise in crafting and exporting a wide range of Fingerboards for violins. The product is made by using high quality wood as the raw material and is subjected to rigorous quality checks in order to make sure that it is truly world class. East India Company also design and export an attractive range of Viola Fingerboards. These are used in violas for supporting the strings of the viola. Our craftsmen take utmost care in crafting these products. We uses the wood which is of good quality. CRAFT WORLD are produced the quality and sizening violin, viola & cello fingerboard. 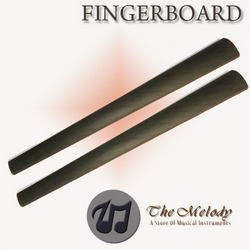 an extensive range of musical instrument components like ebony finished violin finger boards is offer by us. These violin fingerboards are graded according to the colour and pattern of the wooden material. Our products are made from high quality hard wood with high density and ebony finish. We bring in use only the best quality wood that are preferred for manufacturing of violin fingerboard that are an important part of violin. The wood is tested for durability and anti termite properties before being used in manufacturing of finger boards. These finger boards can be availed in standard as well as customized sizes.